Chocolate Pudding and I are no strangers. I still remember the blue/grey tupperware containers that my Grandmother only used for pudding. Each held a single serving and had its own lid so that the dishes could be easily stacked in the refrigerator. I also still remember that our pudding came out of a box. It was years before I knew anything else. In all of my pudding experiences, I have developed a preference for puddings with silky smooth texture. If I use that as my only metric, this particular pudding is not the end all be all to me. The texture was rather thick and dense. But it’s an alternative to other recipes that are filled with egg yolks and heavy cream, if those aren’t your thing. BAH Note: The good folks at Scharffen Berger would like you to prepare this in a double boiler. I didn’t have a bowl and pot available that would make a good double boiler so I decided to do it my way. I lost track of how long it took for my pudding to set but believe me, when it happens you will know. 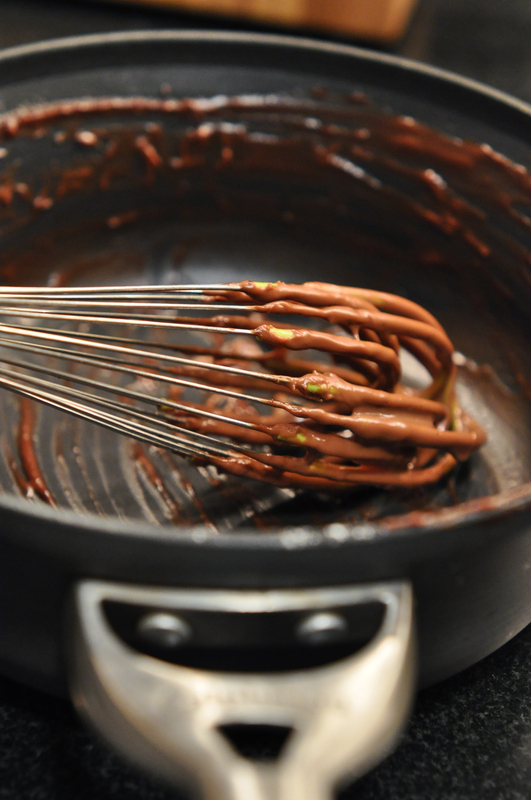 Combine the cornstarch, sugar, salt, milk, and chocolate in a saucepan set over medium heat. Cook, stirring occasionally, until the pudding thickens. Remove from the heat and stir in the vanilla. Transfer to a bowl, cover with plastic wrap (pressing the plastic down onto the top of the pudding), and refrigerate until thoroughly chilled. i am a fan of chocolate pudding… and pudding pops… if you froze these in little popsicle molds, hmmmmm… summer treat! Lan, it never occurred to me to try and make pudding pops. I see a summer project in the works. I like the sound of this recipe – I am not a fan of the ones that feature egg yolks – I can’t get the hang of doing that slowly enough and I always end up with lumps. I can hear Homer’s voice now Jennifer. Oh, and speaking of special pudding Tupperware, my husband had a Tupperware plastic shaker bottle that was made for instant pudding – just add pudding and milk and shake, then pour it into your bowls. That thing was handy. He accuses me of having thrown it away but why would I do such a thing? They made such a thing? How could he possibly think you would throw away such a genius product? I’m glad you achieved pudding success, Wendi. Much like the way bread is used to be for you, pudding is my nemesis. And definitely silky smooth all the way. Ali, pudding wants to be your friend. Promise. You just need to meet the right one. I love Scharffen Berger chocolate. The dark chocolate is of my all time favorites! Nancy, I have a special place in my heart for Scharffen Berger 70% dark. That’s pudding for grown-ups! Sounds amazing! Kitch, it’s definitely a sophisticated pudding. Imagine “scenting” it with some dark rum. Or grand marnier. I would have had to sample the pudding clinging to that whisk. It looks so creamy and smooth! Also, I prefer to avoid using heavy cream if possible, so I appreciate that this is a whole milk-based recipe. That’s funny Jen because I often substitute heavy cream or half and half where recipes call for milk…usually when it’s a small quantity. I’ve never really been a fan of chocolate pudding. Or any pudding really. Mostly because I only ever ate that non refrigerated stuff as a child. I think this is my parent’s fault. Beth, it’s never to late to embrace chocolate pudding. If all you’ve ever known is the shelf stable stuff that has a 30 year half life, I think the time has come for you to experience the real thing. Yeah I would totally eat that pudding if it was in Pudding-Pops form! I think we need to bring back the pudding pops. Kids today don’t know what they’re missing. I love my chocolate pudding with Scharffen Berger chocolate. So rich and creamy. Yours looks delicious! Thanks Tracy. Scharffen Berger makes everything taste good. Jen, I’m sure you could whip some of this up in no time.